Redhaven (sometimes known as Red Haven) is a yellow-fleshed peach, ripening early to mid-season in the UK, so around the end of July - or a week or so before Victoria plums start to ripen. Redhaven has a very good, strong, peach flavour, and juicy flesh. It is best picked and eaten straight from the tree. It is popular partly because of its good flavour, but also because it has some resistance to peach-leaf curl, a common disease of peach trees in the UK. Redhaven is a freestone peach - the flesh comes away fairly cleanly from the stone. 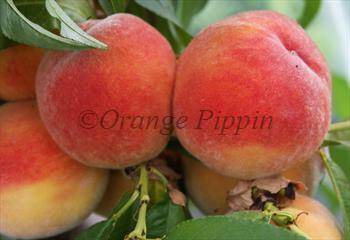 Please fill in the details below and we will let you know when Redhaven peach trees are back in stock. Redhaven is in flowering group 3. Redhaven is self-fertile and does not need a pollination partner, although fruiting may be improved if there is a compatible tree of a different variety nearby. Since it flowers in the middle of the blossom season it can be pollinated by most other peach trees. Peach leaf curl is one of the most serious fungal diseases of peaches and nectarines, and is endemic in the UK. As the name suggests, infected leaves become distorted and eventually drop off, weakening the tree and reducing cropping severely. Redhaven has some resistance to this infection, but it is still important to take additional precautions. The simplest method is cover the tree with a horticultural fleece during the winter, as this blocks fungal spores (which are spread in rain drops and splashes). Redhaven is well adapted to the UK climate and has good vigour and cold hardiness. However like all peaches it needs to be planted in a sheltered position in full sun to ensure it ripens and develops its true flavour. Redhaven was developed by Stanley Johnston at the Michigan State Experiment Station in South Haven, Michigan USA, in the 1940s. It may be descended from an English variety, Hale's Early. It is sometimes known, incorrectly, as Red Haven peach.